Thirty years ago the people of St. Mary’s made a significant commitment to grow our music program with the decision to build a pipe organ for the church. The Berkshire Organ Company was chosen to build a pipe organ for St. Mary’s, but the business was closed following the death of its owner. The Austin Organ Company literally “picked up the pieces” and continued the building project until its completion. Because of the false start with the original firm, the cost of completing the organ was considerably more than the parish had anticipated. The decision was made to use a lesser quality electronic control system in order to save money with the hope that a higher quality console would replace it in the future. Now, many years later, the time has come for us to update the electronic control system and replace the organ console. Over the course of the last 5 years through generous memorial gifts and contributions, we have raised $50,000. The parish finance committee also set aside and dedicated $50,000 to cover the cost. As of early November 2017, we were $40,000 away from meeting the fundraising goal for this special project. Former parishioner and music lovers, Jim and Barbara Diamond have been strong supporters of the organ project. Before he and his wife Barbara moved to Portsmouth, NH they attended the 11:00 AM Mass and enjoyed the adult choir, the organ and celebrating their faith at St. Mary&apos;s. Since the fundraising began, the Diamond&apos;s have made several contributions and when Jim heard how close we were getting to our goal he offered to make one more generous challenge gift of $10,000 to give our fundraising efforts one more boost. If we could raise $10,000 he would match it. In response Jim&apos;s great challenge gift, a committee was formed to plan an Organ Fundraiser event. The committee also thought it would be great opportunity to honor and celebrate Rick Vacca who has been our Director of Liturgical Music for the past 25+ years! We managed to keep that part a secret until the evening of November 16th. 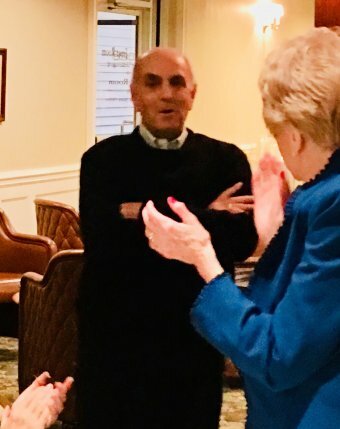 As Rick entered Wachusett Country Club for what he thought was a fundraiser, he was greeted by members of the St. Mary’s Adult Choir, the Liturgy Committee, staff, cantors, musicians, friends, and family. Evan Page who helped to organize the evening shared how much fun it was to coordinate knowing Jim Diamond&apos;s great challenge and that Rick would be honored. Evan shared that we were also able to obtain several leadership gifts prior to the evening and " Once people heard that this fundraiser was for the organ and to honor Rick the money kept rolling in." In his conversations with donors, Evan said people consistently shared how much joy Rick has brought to their lives. " All those that know Rick understand and see that all of his love and kindness is deeply rooted in him." Jim Diamond was able to join us at this celebration and it was great to see that his challenge was not only met, but doubled!! With the leadership gifts received, contributions made by those that attended, and Jim&apos;s matching gift we were able to raise over $30,000! Little notes of appreciation written to Rick by those who attended were sprinkled across each of the tables and Msgr. Mike read some of them to the group. Msgr. Mike also shared his appreciation for Rick on behalf of the parish and announced that since he wore out the console we have today, the parish will dedicate the new console to him when it is installed. Rick was overwhelmed and shared that being at St. Mary’s has been the best part of his life feeling as if he has been surrounded by one big family. How blessed we are as a parish to have had Rick Vacca as our Director of Liturgical Music for the past 25+ years! Following an upcoming 11:00 AM Mass we&apos;ll celebrate Rick&apos;s anniversary as a parish family with cake and refreshments in the Gathering Space. Watch the bulletin & Flocknote for more details. With a little less than $10,000 left to raise, if you would like to make a contribution to the Organ Fund, donation envelopes will be available before and at the reception. Hope to see you there!